The Russian Blue was originally cast into the mould of a 'foreign shorthair'. Back then, breeds were not always instantly recognized, seen or considered as specific breeds, and only two factors predominated in their classification, which was their 'country of origin', and whether they were 'long-haired' or 'short-haired'. Colour, was usually a secondary classification. The Siamese cat for instance, was so-named solely on its country of origin, on the basis that it came out of the country of Siam, and of course it was originally relegated to being a 'foreign shorthair' variety. Many different shades of Siamese colouring were all acknowledged as Siamese. The advantage of the Siamese over the Russian, was that no-one had hitherto seen any cats of those 'colours', the Himalayan pattern, being, in all its variations, unique. But in the case of the Russian blue shorthair, despite it being an imported cat from a number of climes within the Soviet quarter of the northern European continent, its colour was generally speaking, not considered to be unique, and therefore, it became commonly classified as a 'blue shorthair', rather than, as a 'Russian Blue Shorthair'. This failing to separate colours (by regional origin and type) lead to an unprecedented drama around what constituted the correct form and eye colour for the 'blue shorthaired cat'. Blue shorthairs were to be found in England, Russia, Malta, the American continent and a myriad of other places, including Iceland and South Eastern Asia. So, initially the blue shorthair of 'Russian' origin, was just lumped in with the plethora of other blue shorthairs. Over time, English breeders, who were attempting to perfect and develop the English shorthair and who had settled on a specific style, based on a generally large, well-boned, rounder headed, stockier built cat, with orange eyes; saw this as the best and ONLY option for the Blue Shorthair. However, importers and breeders of Blue shorthairs from Russian origins, quite obviously saw it very differently! It appears to have taken many years before their desires were finally met and the two distinctly different 'types' or 'styles' were finally and officially acknowledged. By 1903, 'English Shorthairs' of all colours were being loosely referred to as 'British' Shorthairs, especially as the distinction between the British line of blues was being made, as opposed to the Russian bloodlines of blues. During the long period of confusion, many good examples of both were shown against each other under a common class for blue shorthairs, and as there was only one standard, which favoured the British style of cat, the fanciers and breeders of the Russian variety, only naturally resented the fact that there was no sensible classification for their unique and individual variety and little if any chance of recognition for what they saw as the unique and distinctive qualities of their 'foreign blue shorthair'. This also created difficulty for judges, who, had to judge according to the written standard, no matter what their personal preferences may have been. As a consequence, many vociferous debates raged in the popular cat press of the day over the 'application' of the standard by judges. Due to the lumping together of both varieties into one classification, the pedigrees of both breeds contain in their origins, both varieties. British Shorthairs appear in the pedigrees of Russian Shorthairs and Russian Shorthairs in the pedigrees of a number of British Shorthairs. The definitive separation only happened, when the Russian Shorthair was finally recognized as a 'variety apart'. 'Bayard' was not an imported male, but homebred by Mrs. Carew Cox. Mrs. Carew Cox was a breeder of considerable repute and extensive knowledge by the time 'Bayard' was born on 3rd April, 1898. She had been a breeder and active importer of Russian Blues since the early 1890's, and not just Russians, but also Abyssinians, Persians and Siamese. 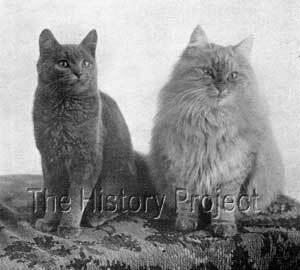 She was the breeder of one of the earliest Blue-cream Persians, a cat named 'Tawny' born in 1892, (NCC:1502). She owned two imported Siamese females 'Yuthia', born in 1893 (NCC:1454); and 'Rayong', born in 1894 (NCC:2022). Her blue short-hairs had also been purchased by other major breeders, just two examples at random being 'Sedgemere Ena' born 21st November, 1893 (NCC:1639), sired by her Russian male 'Moscow' out of 'Dwina', sold to Mr. Sam Woodiwiss, and 'Ballochmyle Bell Burns' born 20th April 1897 (CCR:v1), sired by her Russian male 'Muchacho', out of 'Durma', sold to Lady Alexander of Ballochmyle. "Had not Mrs. Carew-Cox about this time devoted herself to the breed I very much fear it would, ere now, have become extinct. Neglected - Heaven knows why - by the Fancy at large in an inconceivable manner, this beautiful and interesting breed certainly owes its existence to-day mainly to the devoted care and affection bestowed upon it by Mrs. Carew-Cox, who for a quarter-of-a-century has fostered it in the face of discouragements which I believe would have 'choked-off' any other person in the fancy." The above was, in fact, only part of Mr. Brooke's exemplary tribute to the determination and fortitude of Constance Carew Cox. And she certainly is known to have applied this same dedication and fortitude in facing the struggle to get the Russian Blue, its' rightful and due recognition. But unlike the case with the Abyssinian which was struggling for survival, the Russian Blue was a popular breed among many, in its own right. And Mrs. Carew Cox was not alone in perpetuating it. Mr. G. Towlerton, of Flanshaw near Wakefield, was a fancier and breeder of Siamese, Russian and English Shorthairs. He was, in fact, the breeder of the renown English red tabby 'Perfection' later known as Lady Alexander's 'Ballochmyle Perfection'. 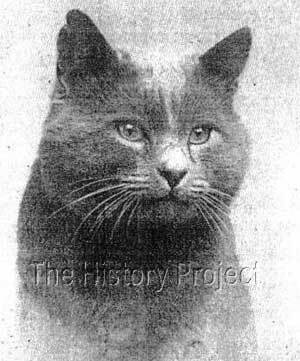 He was also the owner of 'King Vladimir' the Russian Blue stud male who was the sire of both Mrs. Carew Cox's 'Bayard', born in April 1898 (CCR:v1) out of 'Olga'; and Mrs. Clinton Locke's 'Lockehaven Blue Royal' born in March 1899 (BCC:238), out of 'Nell'. The sire and dam of 'Bayard' were 'King Vladimir' and 'Olga' respectively. If we look at the registration of 'Vladimir' in Volume one of the American Cat Association, where he is listed as 'Valdimir', we find that he was imported into Europe and we are informed that his pedigree is recorded in an unpublished volume of the National Cat Club. If we accept the pedigree of 'King Vladimir' as it appears in modern databases; his dam, listed as 'Bete I' or alternatively as 'Bebe I', is shown as a daughter of 'Olga'. This would indicate that the breeding which produced 'Bayard' was in fact a grandmother to grandson pairing, line-breeding on 'Olga' herself. From the point of view of preserving the original lines, it would certainly make sense that Mrs. Carew Cox would do such a breeding and then keep a male to perpetuate 'Olga's' specific bloodlines. The second sibling (a dam-sibling) would have been his own paternal grand-dam, 'Bebe I'. She is listed as the daughter of 'Michael' and 'Olga'. "OPEN BLUE MALE (5): - 1st, Lady Alexander's Ch. Blue King, so well known, with his handsome broad head. 2nd, Mrs. Illingsworth's Acton Prince well deserved his place, as he is excellent in colour, head and eyes but too large in ears.3rd, Mrs. M.Hughes's Sherdley Alexis, rather pointed face but good eyes and correct colour. Reserve, Sherdley Michael, a young kitten that will be heard of again. Vhc, Mrs. Phelps Blue Bottle, a good coloured kitten with pinched face. "13 (Editor's bolding). 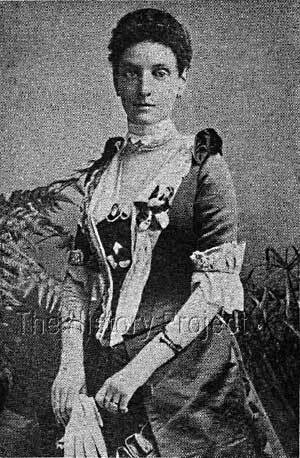 There can be little doubt that Mrs. Carew Cox was an able and successful breeder and that she was also very capable at marketing her favourite breeds. 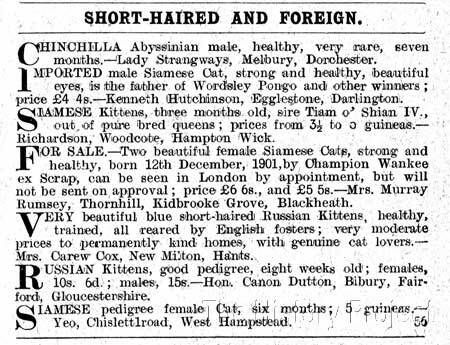 From the editorial columns of 'Our Cats' on 13th June, 1903, we glean a little insight into the opinion of her pet buyers and her ability to successfully promote the Russian Short-hair. Also from this litter came the Russian Blue male 'VOLODYOVSKI', who was sold to Mr. Fred Helmer. (OC:24/Nov/1900).11 'Volodyovski' won a 1st at the Crystal Palace Show of 1900, when only seven months old. For many years, Mrs. Carew Cox continued to push for the recognition of the 'Russian Blue' as a separate variety, abhorring the fact that 'half-bred' blues were "usurping the places formerly awarded to pure-bred specimens, simply because it is far easier to breed them with orange eyes, when crossed with English cats." The below letter to the Editor of Our Cats, published two years before her above comments show how some breeders were content to breed Blue Shorthairs with an exclusively 'British' look and definitively 'orange' eyes. The writer does however touch upon the possibility of also cultivating (and therefore recognising) a separate style of Blue Shorthair, almost without saying as much! "Dear Madam, - In view of the recent discussion respecting the shape of head desired in short-haired blue cats, I think that perhaps it may not be generally known that these cats are to be found not only in Russia, but all over Europe and in America. It is perfectly true that those which hail from Russia invariably possess weak narrow heads, and in addition the greenest of eyes, while those from Malta, America and the British Isles generally have powerful skulls and sometimes (too seldom alas!) that most important point, glorious orange eyes. Why, then, should we faced cat? Surely to be consistent we should equally insist on cultivating his emerald eyes and generally puny appearance. I believe my esteemed friend, Mr. Sam Woodiwiss, is supposed to be the author of this standard, but his awards, whenever he has given us the benefit of his opinion, prove that he does not practise what he is supposed to preach. "For my own part, I have invariably found that the strong-headed orange-eyed British blue has stood me in good stead, and to him I mean to stick, and should strongly advise those who wish to win to do likewise. Despite the above writer's disparaging remarks about Russian versus British Blues, he or she does, through observation confirm the difference in head styles between the two varieties and confirms for us that 'green' eyes are the norm for the Blues of Russian origin. However, many of the registration records confirm that orange or amber eyes were also produced. Both of the 'Lockehaven' Russian blues are recorded as having 'Amber' or 'very fine orange' eyes. Stud advertisement for Mrs. Carew Cox's Russian Blue males, 'MUCHACHO', the sire of Mrs. E.A. Clark's 'Ashbrittle Peter The Great'; and 'BAYARD', who would later sire both 'Ivanovitch', and 'Prince Romanoff'. Although the Blue Shorthair had almost always enjoyed a special classification of its own, the road to recognising that there were two basically opposing types and eye colours and vastly different coat textures in the available gene pool, which needed to be both separated and given individual recognition, was a particularly long and drawn out affair. For many years, the battle waged in the exhibition hall, and in the feline popular press, with breeders falling into one or the other camp, depending on what was their personal point of view on what constituted the correct aesthetic. But for those who had spent many years importing blue shorthairs from abroad, there was no doubt in their minds, that the Russian Blue, was unique, and did NOT emulate the basic structure of the English Short-haired cat, either in form and style, eye colour, or coat. For Mrs. Carew Cox, in particular, these cats were not 'English' cats and never would be, so how could they possibly be lumped in with the 'British Blue', many of which were, in her view, only a hybridised blue shorthair. Now of course, we have them as separate breeds and although they have forged a splendidly definitive look of their own of which the writer is sure Mrs. Cox would have been justifiably proud, they have, due to geographic isolation, been refined into a number of styles and varying types, within the breed itself. However, the standard for coat and eye colour are generally universal and definitively unique. How lucky we are today, to be able to find and enjoy such exemplary examples of the Archangel cat, whose ancient and unique beauty has been preserved against extremely difficult odds. 'Bayard' played his role in that preservation, and in the propagation of those precious early lines.